Fast - or not really? The Huawei MediaPad T3 10 impresses with a quite high processor performance for lower mid-range tablets, but still cannot convince in terms of overall performance. How it manages to do this, you can find out in our test. Positive: Great built quality; compact size; nice design. Negative: Mediocre speakers; poor display; weak processor; no video output. Positive: Solid workmanship; compact size. Negative: Mediocre speakers; poor display. Positive: Compact size; elegant design; nice display; long battery life; good price. Negative: Mediocre speakers. Positive: Nice display; long battery life; low price; good connectivity. Negative: Only 2GB RAM; poor display; low gaming performance; poor cameras; mediocre speakers. Positive: Solid workmanship; metal case; support LTE; nice performance. Negative: Poor cameras; low gaming performance. 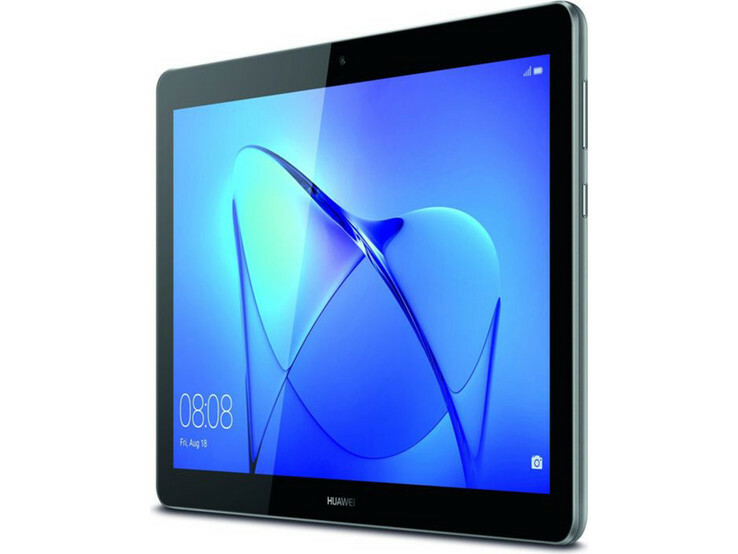 Model: The Huawei MediaPad T3 10 impresses with a quite high processor performance for lower mid-range tablets. The back is made from one piece of anodized aluminum, a feature made fashionable by Apple's iPad. Huawei also builds its tablet in this way, making it available in space gray or a luxurious golden color. The case is clearly built and due to its rounded edges, it fits in the hand nicely. But the screen is not 100% protected: a medium amount of pressure from the back and front will be reflected in the liquid crystal display. The tablet can be twisted minimally and also shows this through colored traces on the screen. Overall the stability is okay, especially for this price range. The 16:10 screen format makes the tablet slightly more square than most of the comparison devices with a 16:9 screen. The MediaPad T3 10 is quite compact and also quite slim at 8 mm (~0.3 in). Moreover, at 460 grams (~1 lb), it is lighter than all the comparison devices. The tablet has a SIM slot on the left side, so the case cannot be opened. As for the display, the user has to be content with 1,280 x 800 pixels. On such a large screen, that is really noticeable and the display appears less sharp than that of the Full HD comparison devices. The IPS screen has the 16:10 format, so in landscape format, it is a little higher than 16:9 and there is not quite as much space in the width. With 16 GB of storage and 2 GB of working memory, the MediaPad T3 10 is on the standard level for this price class. The operating system is based on Android 7.0. On top of that is Huawei's own EMUI 5.1 user interface, which does not change the Android operating principles, but rather extends them. For example, swiping from the bottom edge upward on the quick glance screen will offer some quick access features, and the settings look marginally different and are slightly extended. The "Intelligent Support" menu item contains options for turning the device on or off automatically, for example when the user is not home. The cameras in MediaPad T3 10 do not offer a very high resolution. The buyer is offered 5 MP in the back and a meager 2 MP in the front. As a result, the pictures of the front camera appear slightly artificial, the color areas spotty, and there are apparent color auras around objects. Moreover, colors appear quite pale. Inside the Huawei MediaPad T3 10 runs a Qualcomm Snapdragon 425, although, with a slightly throttled clock speed of a maximum of 1.4 GHz. In terms of performance, despite the throttling, it is sufficient to provide a clear advantage compared to the predecessor and also to most of the competing devices. Subjectively, games do not take any longer to load than on other similarly priced tablets. The MediaPad T3 is essentially a low-midrange tablet targeted for users who do not need much. It does a pretty good job for a tablet at its price range. 71.23%: This rating is bad. Most notebooks are better rated. This is not a recommendation for purchase.